Totally agree, concepts are a nice idea but as you say I bet they cost a lot to produce. Hi there, I also agree on some. But some of them I would say we could do at a reasonable cost, especially the perfed one as we can hand perf some stuff in 250 quantity works. The perforated "Divorce Lawyer" one is soooooo clever. NOTE: The frosted and plastic business cards are actually quite affordable nowadays. 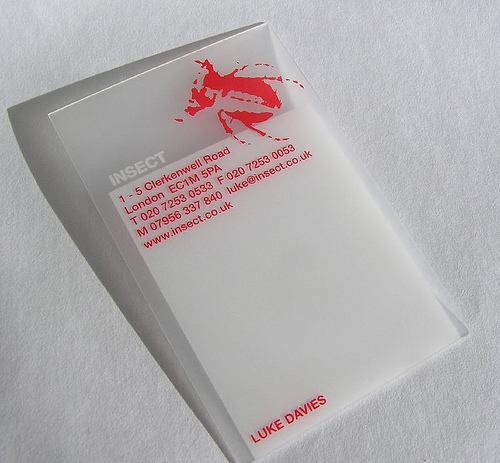 Have you ever used full colour clear frosted plastic business card? Cool and impressive, it makes you remembered by your potential client. If you are a designer, this card represents you with a unique image. It implies that you can provide your client something different from your competitors. You can find these cards on my website. Genius! There's some very creative ideas on here! I had to create solutions like this all the time at uni (I did advertising), I loved being witty and inventive with things like that! A fellow graphic designer friend of mine once had a laser cut business card, where the letters were laser cut out, it was gorgeous but apparently a pain in the arse to setup plus the actual costs of production were huge, they did look great though and definately memorable as this was around 4 years ago now!